It's hard to believe it's already December! It seems I'm not capable of blogging when my busy pottery season really gets started. Here's my quick review of how I danced through the warm market season and the end of the year. I'll actually start a bit earlier than my last post. In May, I decided to take the plunge and officially become a real business. Woohoo! We finally got the garage wired to safely run the kiln. Loading a whole booth into our hatchback was getting impossible, so we upgraded to a pickup truck. I manned the BGCW booth at the Greenwood Market once per month this warm market year. When throwing at BGCW, I've realized that I'm well on my way to becoming one of the those members that I used to admire, "hate", and not-so-secretly longed to be, with a whole table a pots that I threw that night during class. 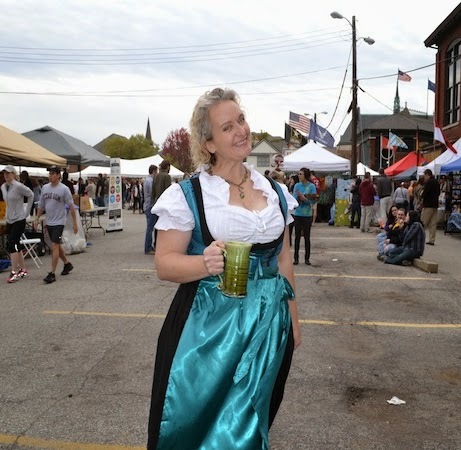 This year was my first time at ArtSquared, a fantabulous art fair and other arty events in my own neighborhood in Fountain Square. It rocked. Four of us teamed up to have a double booth and we had an amazing day. Debuted at ArtSquared were the amazing fantastical mugs that Ben Jackson and I partnered on. I had the easy part, providing the bare-bones mugs for Ben to sculpt creature-y handles on. He's still sculpting more now! 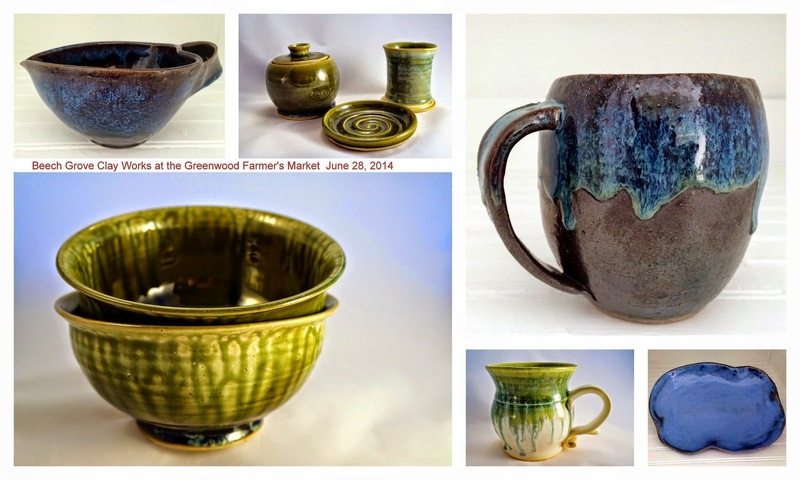 A few weeks later, I returned to GermanFest at the Athenaeum, with 2 other potters. We had a great time. It was cold, but when has that ever stopped me from costuming myself appropriately? 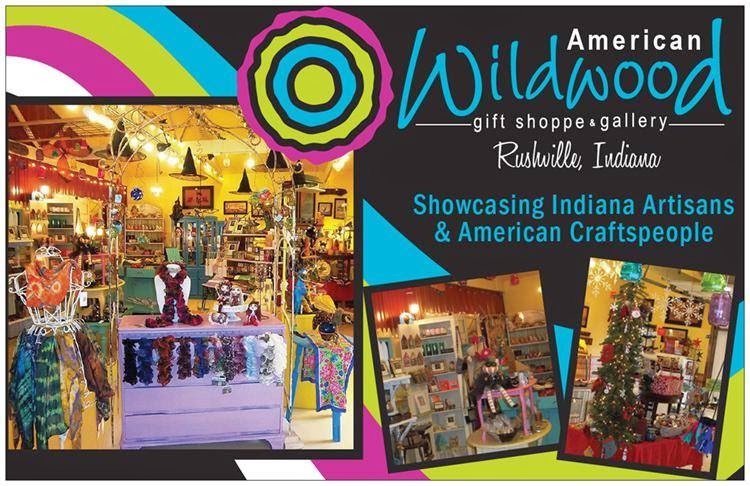 On the heels of these successful fairs, I boxed up most of the rest of my remaining inventory and took it to the American Wildwood Gift Shoppe in Rushville, Indiana. I was lucky enough to get contacted by Dawn Moran, the co-owner of this wonderful little shop, to be one of their Indiana artists. And then I was exhausted for a bit. And shocked at how empty my crates of pottery were. And continue to be. With the holidays approaching, just about everything I've managed to make has been snapped up by wonderful customers, donations to great causes, or my own gifts to folks. This is a great effect, but I long to see my inventory rebuilt! I better get thowing!! 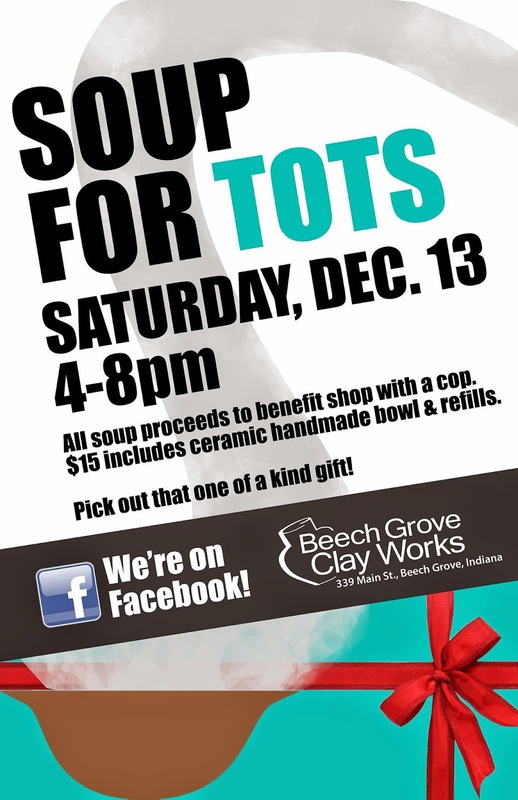 One of the great causes is happening this Saturday--Soup For Tots supporting Shop with Cop at Beech Grove Clay Works. Lots of great bowls from many of the studio's members, including me! The wonderful Jessica Murphy and I will be the BGCW booth at the Greenwood Farmer's Market, this Saturday from 8am until noon. Hope to see some friends there! And in other news...I've started to add some pottery to my storefront at the Square Market (kinda like Etsy, but easier to deal with for me!). 1. 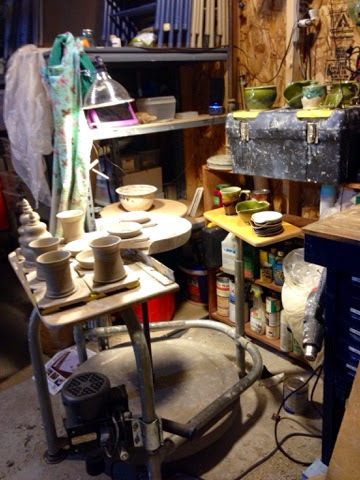 Throw a bunch of pots at the Monday night class at Beech Grove Clay Works, bring them home, and let them start to dry over night. Stumble to bed because I didn't leave the studio until 2 hours after class ended. 2. After dragging myself awake the next morning but before I left the garage, I realized that the pots weren't covered. I'd flip them over, so the bases could dry, maybe drape some plastic around the portions that were nearly leather hard, vainly try to remember that I was in work clothes and I shouldn't wipe my clayey hands off on my pants as I headed to the office. 3. When I got home from work on Tuesday, the pots were nearly ready to trim, so I'd cover them all the way in plastic and try to convince myself to go inside to change out of my work clothes before trimming anything. Sometimes it worked. 4. Before I headed back to BGCW to monitor open studio on Wednesday evenings, I'd manage to trim the pots. I would bring them with me to the studio to dry all the way and then they could go into the kiln. 5. 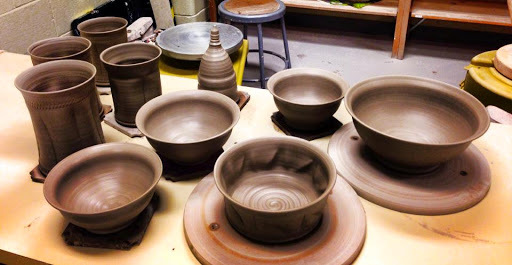 While I was at open studio, I'd throw a bunch more pots...and the whole cycle repeated over and over. 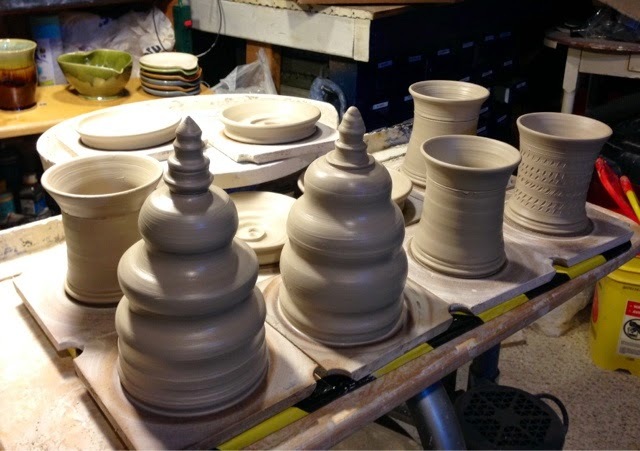 Nearly every Monday and Wednesday, I would bring at least a few trimmed pots in to be fired. This all came to a screeching halt when winter actually came to central Indiana last year. My freshly thrown pots would take days to dry when the temperature got cooler and once the freezing temperatures hit, I could no longer leave bags of clay or unfired pots (greenware) out in the garage. The moisure in the clay freezes and separates out, leaving a big mushy mess. So all winter felt like a failure to me. I was still throwing and building pieces, but at what felt like a staggeringly slow pace. 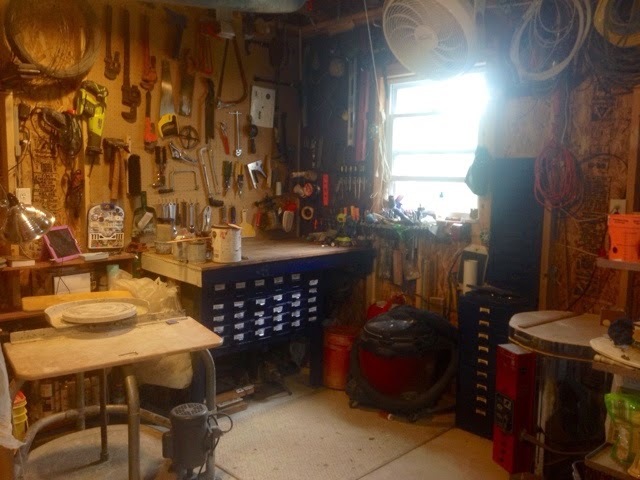 And in December, my folks downsized from a house with a big garage to an apartment--and I was the grateful recipient of most of my dad tools. In fact, I even got to take home his old work bench, made from the same hardwood that the floors of my childhood home had. Unfortunately, the tool bench and all the wonderful tools and a half century of bits of hardware ended up piled on top of my little garage studio. I spent many many days (weeks?) organizing everything back into sanity this spring. Wahoo! So clean and organized!!! And now, I'm back to my old routine! The back of the photo shows a few of the things I threw in the last month--a stack of spoon rests, some little heart shaped mixing bowls, mugs, a honey pot. 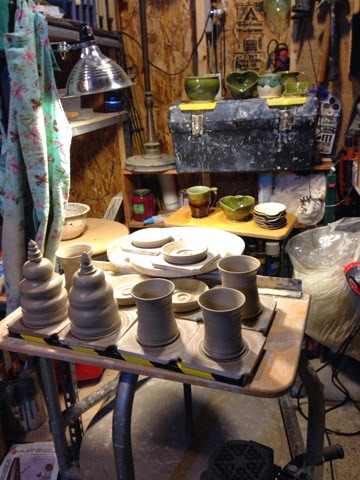 And in front and on the wheel are the things I threw tonight at open studio--a few bathroom sets (toothbrush holders or drinking glasses and soap dishes) and luminaries. I am so excited!!! And productive!!! 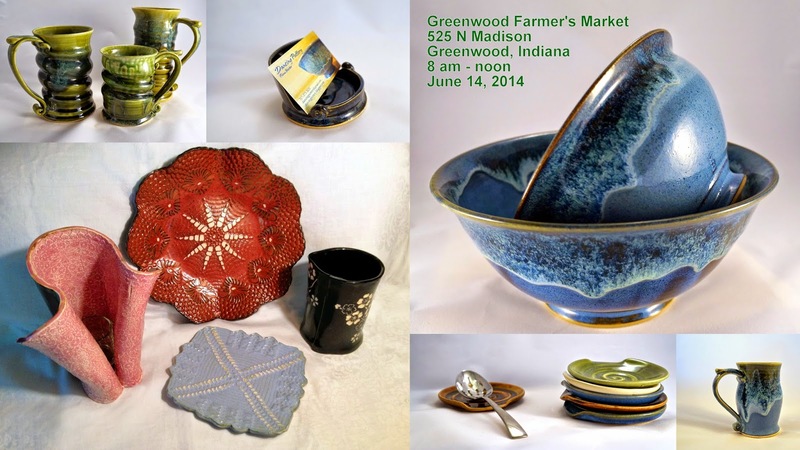 Will have awesome pretty pots for my next appearance at the Greenwood Farmer's Market on June 14th!!! Last Saturday was my first farmer's market of the 2014 season. For the week before the market, I herded together all of my pottery creations left over from last year and all the pieces that I made over the winter. It turns out that my production level has bumped up significantly in the last year. I remember that for the first market of 2013, I had one bin of pottery. This year, I needed to fit 3 bins and a few boxes of finished work into my car. Woohoo! Knowing my usual bleary morning habits, the car was all loaded and ready to go on Friday night. At the crack of the next morning's dawn, I headed down to the Greenwood Farmer's Market. My darling hubby, Doug, followed along as well to help me set up. We quickly unloaded, got the canopy and tables set up...and then Doug headed off to do some fishing! I scurried about, unpacking pottery and getting it arranged on the shelves. As I was putting out my business cards on the nifty business card holders that I make (go go functional pottery! ), I noticed that the wind kept blowing them off the holders. And boy, did that wind blow and blow and blow. Vendors all around me were grabbing for their canopies, as wind tried to make them into giant kites. Lots of folks took down their canopies immediately. But while my canopy did weave a bit on top, it was solidly anchored. This winter, I finally got around to making some good weights to anchor down the canopy. It seems that 30 pounds per corner will stand up to 20 mph gusts! To be fair, I was still anxious through the whole market, also tied it down to my car and held on to the frame. And with the help of the fabulous vendors at Greenwood, took it down when the wind REALLY starting picking up. I made the weights with these instructions. I picked up all the supplies at Home Depot and had help there to cut the 10 foot long PVC pipe into four even sections. In addition to these instructions, I also attached sturdy handles halfway down the outside length of the pipe before I poured in the cement. Please take note, that these weights are attached to the top of the canopy frame with hooks and straps and securely fastened to the legs at the bottom. I will also remember to check the forecast for the wind speed before the next market! And just another plug for the Greenwood Farmer's Market. This is my favorite weekly market in Indy area--great goods, fair prices and wonderful vendors! Every time I am there, I am delighted with the folks who visit the Beech Grove Clay Works booth to shop. It is fascinating to see the different ways people interact with pottery--how they feel a mug, or gravitate toward a certain set of colors or shapes. And more than just the customers, it's a delight to get to know the caring organizers and vendors who are always so friendly and helpful. This good feeling was reinforced last weekend as neighboring vendors helped keep canopies and goods from blowing away and hurting people. Someone was always on hand to help catch things as they flew away or offering assistance in taking down the canopies of tumbling doom. Thanks Greenwood, you rock! !